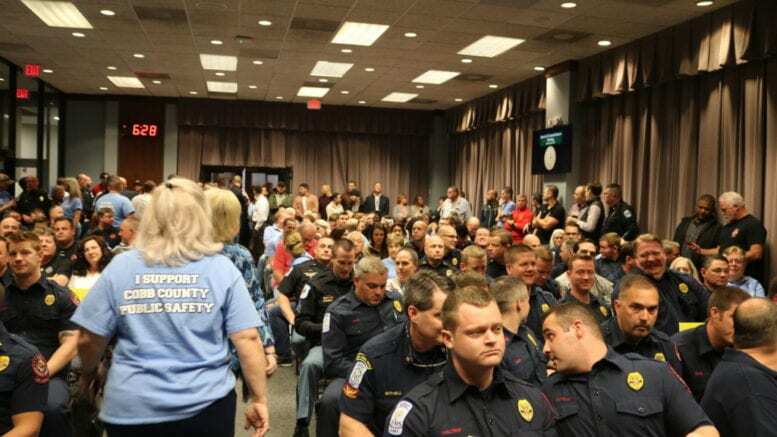 Cobb Police and firefighters, and their families and supporters, packed last Tuesday night’s meeting of the Cobb County Board of Commissioners to lodge a protest for higher staffing levels, more pay, and improved benefits. One retired firefighter also raised the issue of lack of diversity in the fire department’s workforce. The meeting was marked by heated comments and exchanges, even before it officially began. McMorris said she wasn’t talking about the police and firefighters who showed up, but only department heads and employees who had showed up for other business. Seventeen speakers signed up for public comment, so BOC Chairman Mike Boyce split the list so that roughly half spoke before regular BOC business and half afterward. “And so what I’m here before the board today, is to ask that the board take accountability for the administration that served as the fire department management during that time period, the director of public safety during that time period, as well as the director of human resources,” he said. He said currently there are three firefighters per engine. “When responding to a house fire, the four personnel on a fully staffed engine are able to divide into two teams of two, and accomplish two tasks at the same time.” he said. He said the problem with three-person staffing is that firefighters have to make a choice between continuing to keep fighting the spread of the fire, or entering the building to search for victims. Kim Hill, of Blue Thanksgiving, which she described as an organization to support local law enforcement, first responders, and public safety spoke next. She said that commissioners have been warned of a crisis in public safety for five years, and have ignored it. ‘It’s not a crisis.’ It was a crisis six years ago when I tried to have breakfast with Tim Lee and explain it to him. And he told me it wasn’t a crisis and he didn’t want to deal with it, but it’s worse now. It’s a crisis mode that’s now become SOP as you heard from that young firefighter who was forced to leave Cobb. “It’s not your priority to worry about greenspaces and libraries as your first mission. 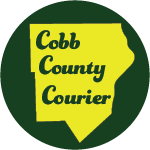 Without safety and security, Cobb does not and will not prosper,” he said. The audience broke into applause. He added time to Gaynor’s allotment. “But the point that I’m making here is that I said to her ‘You need to go find the same level of interest this year that I saw last year’, and ladies and gentlemen she did exactly that, which is why you’re here today,” Boyce said. Proposed Smyrna ordinance: Hands off the cell phone and on the steering wheel! 3 Comments on "Cobb Police and firefighters protest staffing levels, pay at contentious BOC meeting"
Pay more now. Fill vacancies by offering competitive compensation. I am appalled that this has yet to be handled yet we find money for projects that do not affect every adult and child in the county. The pay study and our number of vacancies show a need to pay some junior police a little more money. We seem misfocussed on building new training facilities to train police who leave us and unfocussed on keeping more of the police we have already paid to train.